Spanish Romantic Francisco Goya was the court artist to the Spanish crown through highs and lows. Yet it isn't portraits of royalty for which he is best remembered, but for his brutal and moving masterpiece The Third of May 1808. 1. The painting commemorates a dark moment in Spanish history. In 1807, Napoleon Bonaparte's forces crossed the Pyrenees into allied Spain under the pretext of invading Portugal. Once in place, the infamous French emperor began to take control of regions of Spain. When he realized what was happening, King Charles IV attempted to flee to South America. But before he could, he was forced by angry citizens to abdicate in favor of his son, Ferdinand VII. Sensing an opportunity, Napoleon invited both Charles and Ferdinand to France. Fearing their leaders would be executed, the people of Spain rose up against the army, and were brutally suppressed. It is this suppression that is detailed in The Third of May 1808. Two days later, Napoleon forced both kings to abdicate in favor of himself, and would ultimately install his brother Joseph as Spain’s new monarch. Rather than being executed, Ferdinand VII was imprisoned for 6 years before he was allowed to reclaim Spain's throne. 2. The Third of May 1808 is known by several names. There are variant titles, including The Shootings of May 3, The Third of May 1808 in Madrid, or The Executions. Sometimes named for the location on which it is staged, the painting has also been called The Shootings on the Príncipe Pío Hill. Its grandest title is The Third of May, 1808: The Execution of the Defenders of Madrid. 3. It has a prequel companion piece. Completed two months before its more iconic cousin, The Second of May 1808 depicts the actual day of revolt known as Dos de Mayo Uprising. While this work showed Spanish civilians in a moment of victory, The Third of May 1808 presented the French response the following day, when Napoleon's soldiers slaughtered hundreds of Spaniards in one cruel, dark night. 4. It can be read as an apology from Goya. During the tumultuous French occupation, Goya maintained his position as the court's painter, meaning he had to swear an oath of loyalty to usurper Joseph Bonaparte. When the French where finally expelled from Spain in February of 1814, Goya asked the nation's provisionary government to "perpetuate by means of his brush the most notable and heroic actions of our glorious insurrection against the Tyrant of Europe,” which led to the commission of this pair of paintings. 5. The Third of May 1808 received negative reviews. The daring artistic choices in the piece earned critics’ scorn. Goya broke from tradition by presenting his war heroes in a less than epic fashion, allowing the Spanish civilians to look like a bramble of humanity. He also included blood, an unpopular device in history paintings of the 19th century. Others docked the piece for its flat perspective and unrealistic staging. 6. Christian iconography contributes to its emotional weight. While Goya rejected the tradition of making his subjects beautiful in their heroism, he embraced the chance to make them divine. Notice how the man at the painting’s center raises his hands in a pose similar to Jesus hanging from the cross. And if you look closely, you'll notice that like Jesus, this man has a wound on his right hand, reminiscent of stigmata. In this context, these Spanish rebels are presented as martyrs who died in love and service to their homeland. 7. The use of the lantern is subversive. Baroque artists famously used light to symbolize the divine, but in The Third of May 1808, a radiant lantern is the tool that allows the French soldiers to carry out their bloody business before the sun comes up. 8. It's believed to be anti-war. The blood, the men weeping for their lives, and the soon-to-be shot figure with his arms outstretched all contribute to the notion that Goya wanted to present battle as horrible, not noble. While respecting his fellow Spaniards who died in the effort to liberate the city, he makes war and its casualties look grotesque. The soldiers killing unarmed men are turned away so that the viewer cannot connect to them. War—according to Goya—is darkness. Or as 20th century art critic Robert Hughes wrote, "Most of the victims have faces. The killers do not. This is one of the most often-noted aspects of the Third of May, and rightly so: with this painting, the modern image of war as anonymous killing is born, and a long tradition of killing as ennobled spectacle comes to its overdue end." 9. It's bigger than you might think. The Third of May 1808 measures in at 8 feet, 9 inches by 11 feet, 4 inches. The Second of May 1808 matches its size. 10. Both pieces were damaged in another Spanish war. The damage didn’t happen during battle, either. In a bid to protect the paintings, The Second and The Third were being transported to Valencia and then ultimately to Geneva via truck during the Spanish Civil War (1936-1939), when a road accident wounded both works. A keen eye can spot the damage on the lower left hand corner of The Third of May 1808. 11. This marked a turning point in Goya's style. The French occupation made a deep impact on the painter. While he'd supported the French Revolution, he was scarred by the horrors and subjugation he witnessed during the French occupation. While his works had previously shown an interest in social and political commentary (including his Caprichos series), art historians have noted that his work grew darker in both color and content beginning with these paired rebellion paintings. 12. Nobody knows when the public first saw The Third of May 1808. Historians have found no references from 1814 that detail the painting’s debut. However, this gap in the historical record may have stemmed from Spain’s reigning king, Ferdinand VII, not being a fan of the work and its sentiment. The monarch had actually put a stop to plans to build a monument in commemoration of the uprising's fallen. 13. It has since found a proud home in Madrid. Some historians speculate that the painting spent up to 30 years in royal hands (or royal storage), before being gifted to Madrid’s Museo del Prado sometime between its opening in 1819 and 1845, when art critic Théophile Gautier mentioned it being “relegated without honor to the antechamber” of the Prado. The first official record of the work in the museum's published catalog is dated 1872. But in 2009, Prado declared the painting one of the most important in its collection, leading to its posting on Google Earth with a resolution of 14,000 megapixels. 14. The Third of May 1808 inspired other acclaimed artists. 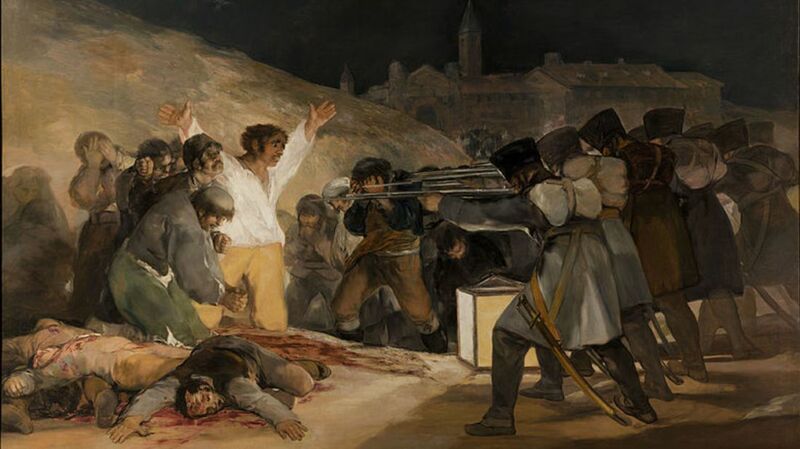 Both Edouard Manet's Execution of Emperor Maximilian and Pablo Picasso's Massacre in Korea show influences from Goya's disturbing depiction of war. In 2006, this connection was celebrated with a special exhibition at the Prado. 15. It has become one of the most admired paintings of war. Compared to Picasso's Guernica for its fearless depiction of the brutality of war, The Third of May 1808's estimation has only grown in the art world. Once sneered at for its departures from convention, today its blend of Christian iconography, its emotional chiaroscuro, and its influence on fine art and popular art have helped establish its reputation as a groundbreaking masterpiece. Or as art historian Kenneth Clark puts it, "[The Third of May 1808 is] the first great picture which can be called revolutionary in every sense of the word, in style, in subject, and in intention."